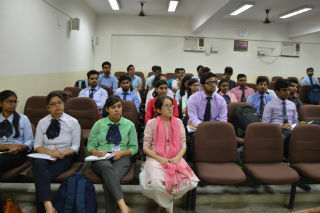 A guest session was organized for PGDM- 1st year students on ‘Rural Marketing’. 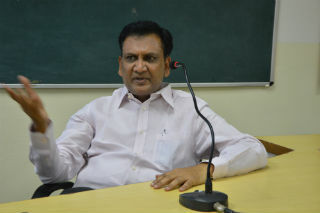 Mr. Vineet Mittal, Director Upwards & Emerging initiated the session with explanation on concepts of marketing. Marketing is understanding the need and human insights. This is fundamental for any market. However, marketing strategies and techniques differ in case of rural marketing. India comprises of 66.86% of rural population, hence, making it the largest rural market in the world. Rural areas are structured into various administrative units namely State, District, Tehsil and Village. Government of India adopts certain norms for census calculation of the same. Population density, consumer behavior and distribution network call for the major challenges in case of rural marketing. In spite of this, it doesn’t kill the underlying opportunities to market successfully in the rural areas. One just need to have a good understanding of schools, Health Centers, Anganwadi, Transport, Haat Bazaar and Feeder Towns. There are certain myths regarding rural marketing. A few among these being homogenous market, occupation groups, cheap product and low purchasing power. However, in the recent past, it has been observed that rural areas have shown a positive economic growth and are moving towards development indicating better connectivity via roads and transport, enhanced quality of education, wider coverage of television, more smart phone users etc. Marketers make strong use of rural media which includes spreading a word via television, radio and print media in addition to static media like wall paintings, interactive sessions in events like Melas. Two case studies were discussed on the same note: First being on “LIFEBUOY: SWASTHYA CHETNA” with mission ‘Visible clean is actually clean’, focusing on health awakening in rural India. This very event was carried out in various schools near Meerut where importance of washing hands before and after having meals was taught. The students were given knowledge on cleanliness level in terms of germs, shown via UV radiations. It was further extended to SWASTHYA PARIVAR DIWAS, where families of the students were also involved. Second case revolves around the villages of Allahabad, named “BIG DISHA: by Reliance Media”, an initiative taken to provide directions to dreams of small town and rural youth by organizing KNOWLEDGE GUIDANCE SEMINAR wherein students were given free counseling on future career options, education and other fields. The session ended with student interaction and query handling by the speaker itself. It was a great learning experience for the students.